Hey! I'm so glad you're here. My name is Tracy and I'm a designer, photographer, and digital marketer with a serious thing for plants. A few years ago, I was a marketing exec working for one of the biggest media brands in the world. It was my dream job. But it looked 1000% more glamorous on paper than it was in real life. In a desperate effort to pull myself out of the daily rut I was experiencing, I invested $300 in a jewelry making workshop, not quite sure of the void I was trying to fill in my life. That single investment led me to launching my own lifestyle brand, Kalaki Riot. I learned the ins and outs of building a brand from the ground up. I learned how to execute big brand marketing on a small biz budget. But the biggest game changer of all? I figured out exactly how to turn my business into an actual brand experience. With Kalaki Riot as a case study, I found myself saying yes to more and more opportunities where I could help others in their own pursuits of (biz) happiness. But it wouldn't be until much later on that I would realize how unique my experience of being both a creative designer and a businesswoman really is -- having been on both sides of the business means that I know when there is money on the table and big wins for brand owners just like you. It was time to make things official. I founded Uno Dos Trae, a satellite creative studio, to help purpose-driven entrepreneurs create more connected brand experiences that are well-designed for their businesses. We specialize in custom web design, full brand identity, and smart visual marketing that will truly transform your business and grow with your brand (and your bottom line). There are so many fantastic ideas that will never see the light of day and I find that kind of reality unacceptable. Because I've seen the incredible things people can do when they share their story and mission with proper branding and a killer website in place. They change the course of their lives for the better. They find confidence. And most importantly, they are able to work towards the kind of widespread impact they want to see in this world. And there are few things more fulfilling to me than when I help others find their visual voice and achieve those same kind of results. looking for something more official? Tracy Dungo is a designer, photographer, and marketing strategist. 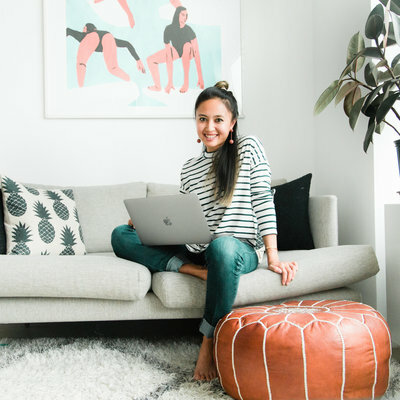 She graduated from Brown University and has since built her career working for content-driven brands like Ralph Lauren and People Magazine before launching her own e-commerce lifestyle brand that she built from the ground up. Her background in digital marketing has very much influenced the way she views branding and design and this strongly translates into her data-driven approach to visual marketing as a result. Tracy's work has been featured in such publications as People Magazine, Real Simple, Well + Good, The Huffington Post, Tory Burch Daily, ADIDAS, Saucony, The Inertia, and more. She is also a contributing writer for The Huffington Post, Thrive Global, and Insider. When she's not helping others launch their dream brands, you can find her chasing the sun between LA and NY with her family or behind the camera at her travel photography shop, The Superette. You know better brand visuals are within reach...if only you had a little organization and guidance. Check out my free resource library for the essential tools you need for a better looking brand. want a better looking brand? Visuals can be tricky. You know what you need done but you're busy building your business and you just want things done right. Grab a coffee and let's chat.